Super Hero Boy: A gigantic turnip? 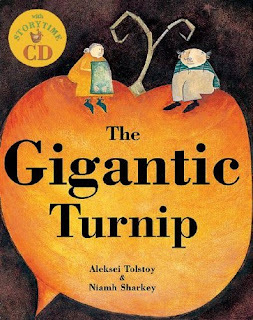 Even if you have heard the old Russian tale about The Gigantic Turnip I guarantee the tale of the Gigantic Turnip as told by Aleksei Tolstoy published by Barefoot Books has to be the best rendition I have ever seen. I know I've ranted and raved about how I love Barefoot Books and their ability to bring multicultural tales to children in a way that crosses all the boundaries. The gigantic turnip is a classic Russian tale about an older couple, their crooked run down house, animals and of course their garden where they plant vegetables for the season. Peas, carrots, beans, potatoes, and of course turnips. All of which sound particularly yummy to me except for the last but it's not my garden. heh. Through some rain, love, and the patience of the couple one of their turnips grows so large that the old man cannot pull it up himself. It takes both the old lady and old man, all their animals, and even the house mouse to pull the gigantic turnip. Can you even imagine having a turnip so large you can't get it out of the ground? The old lady makes turnip stew for everyone at the end but I can not help to wonder what she did with the leftovers. 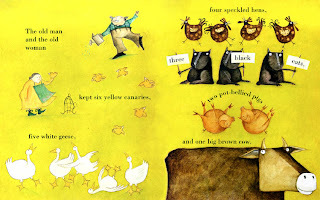 The illustrations are excellent, the story is really easy to read and fun, and of course there are some counting aspects with the animals that are part of the story and its not that obvious that the gigantic turnip at least partially a counting book but they sneak it in in a fun way. In the end the little forgotten house mouse is the hero, how cool is that? The Gigantic Turnip is available directly from Barefoot Books or you can pick up a copy on Amazon! What beautiful illustrations! I'm bookmarking this for my niece's birthday later this year.